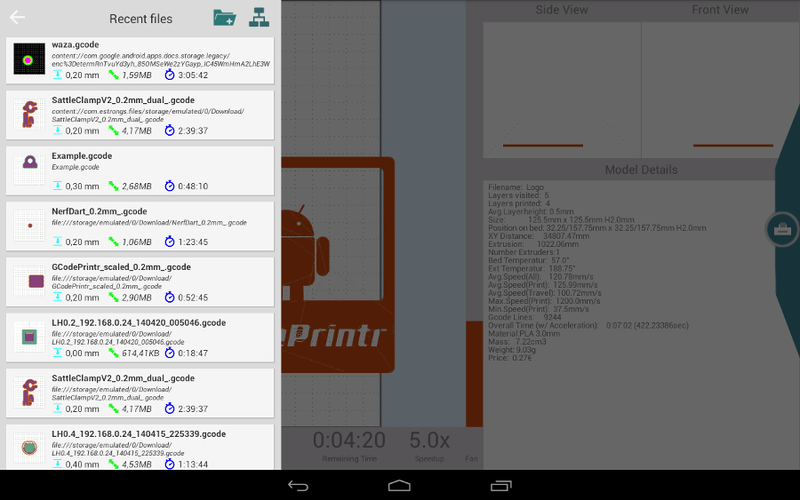 A new version of "GCodePrintr - The 3D Print App" has been released, after severaly month of development and beta testing. 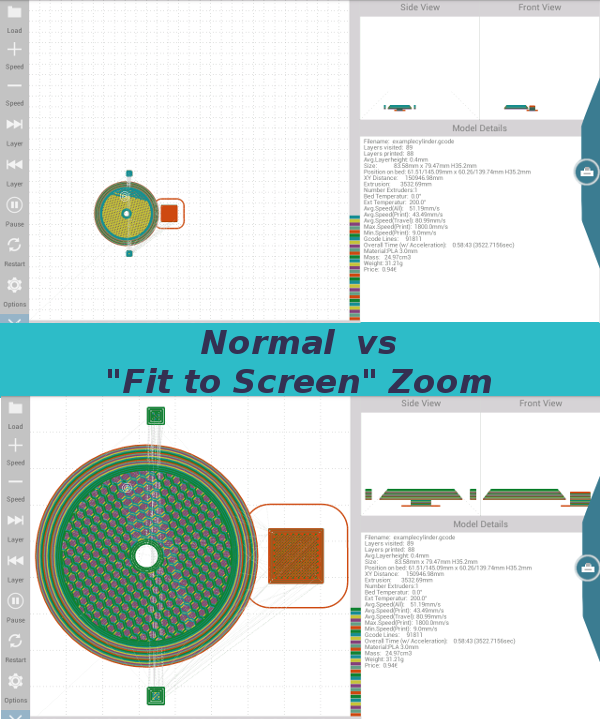 It comes with many improvements and several new features, which will help to maximize the capabilities of your 3D printer. Many features are based on input from the large GCodePrintr community: Thanks for your feedback ! If you are new to GCodePrintr, get an overview about the App here first. Support for custom print bed sizes has been added. Users can enter their own X and Y values from 50mm up to 2500mm. It also supports now non-square bed size and will render it accordingly. GCodePrintr comes with a new slide-out panel to show recently used files and to load files. For each recent file it shows the layer height, file name, file size, print time and a thumbnail of the printbed. 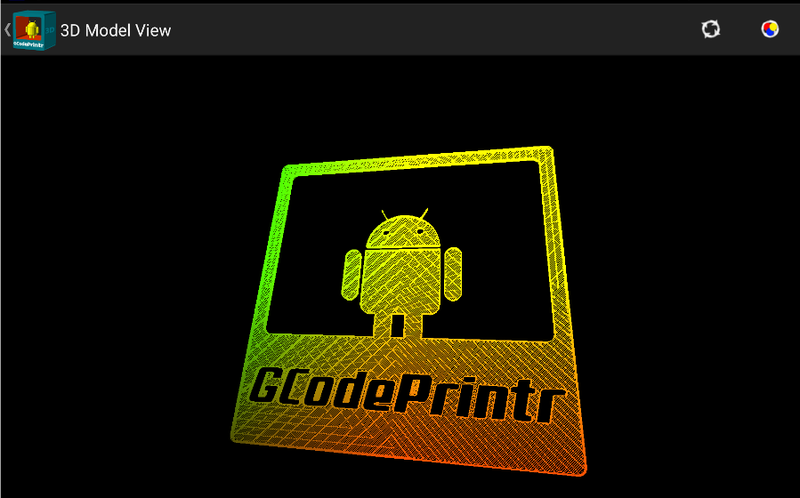 GCodePrintr allows to zoom into the model view. It will automatically fit the model to the available screen. Use the Android Zoom gesture on the painted model to zoom in or out. A 3D preview of the 3D model has been added. It renders the full 3D model (all layers) and automatically rotates it. You can choose between three different coloring modes: by speed, by layer or by coordinates. The 3D view can be opened with a double tap on the print bed or by tapping the 3D icon in the upper left corner. Option to paint non-print moves (travel) as full lines. 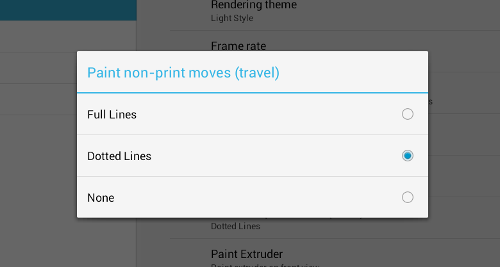 Previous versions of GCodePrintr allowed to paint non-print moves (travel) as dotted lines. But when using GCodePrintr for CNC maschines, all lines are non-print moves. 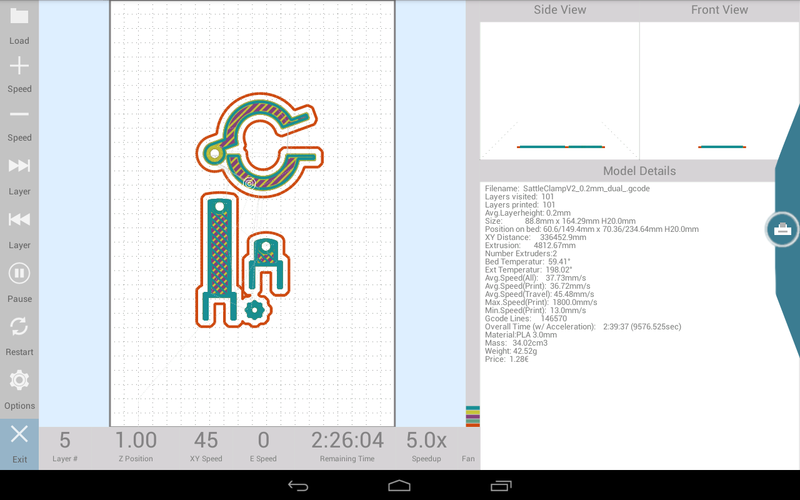 The new option will print those moves as full lines to allow CNC gcodes to be rendered. 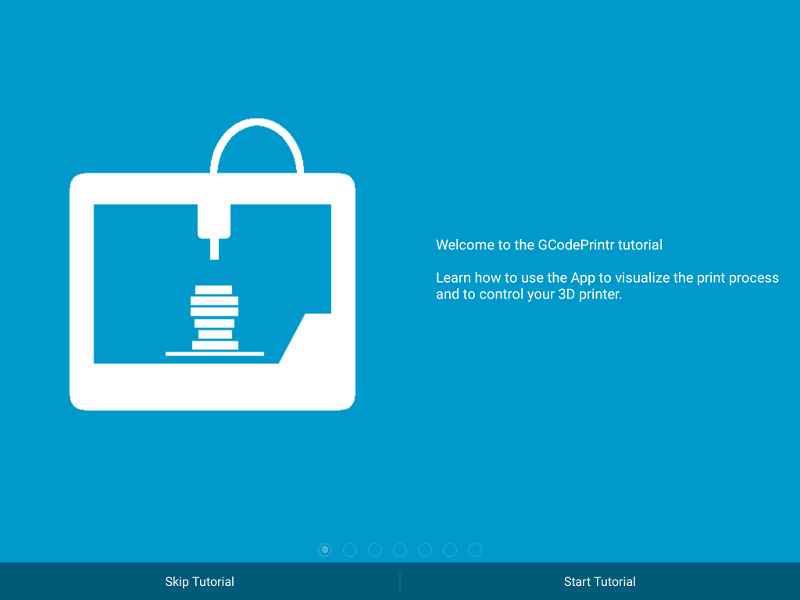 On the very first start of GCodePrintr it will show a tutorial to explain the very basics of the App and the 3D print process. A new menu item in the options will allow to start the tutorial later again. GCodePrintr allows to recover a failed print by starting at a specific line. It will skip the lines before (incl. homeing and temperature) therefore you must do these steps manually before starting the print. Controlling the temperature using a slider can be quick and easy, but if you want to set the temperature to an exact value it is sometimes hard to find the correct position. 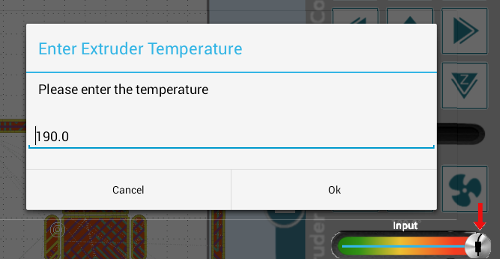 GCodePrintr will now open a temperature input dialog when you move the slider to the max position. This allows you to enter the exact temperature very quick. 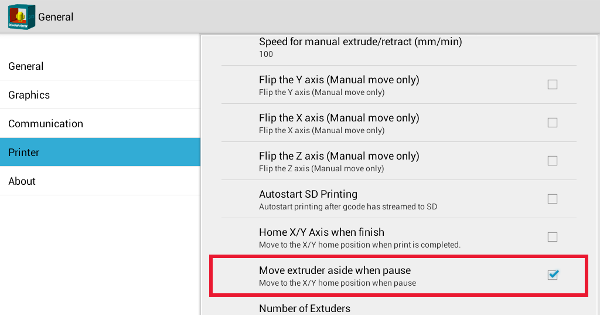 When pause in the middle of a print, GCodePrintr can now move the extruder aside (0:0) to avoid having filament blobs on the model. The App will remember the original position (XYZE) and return to that when doing un-pause. This improves the filement change process significantly. 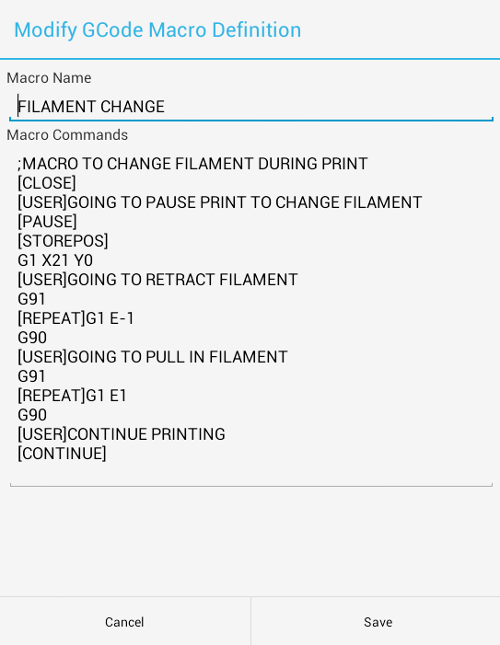 GcodePrintr comes with a predefined macro to easily change the filament even during a print. When the macro is started it will guide the user through the filament change steps and continue printing when done. 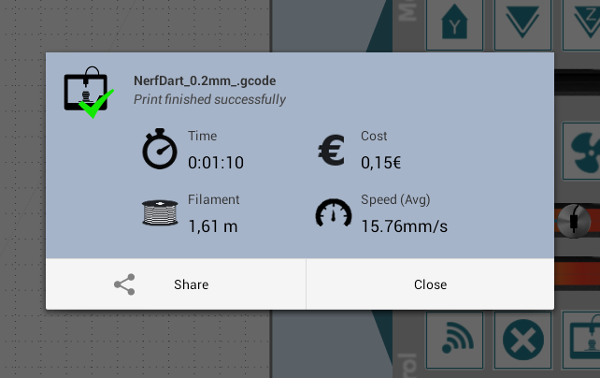 When the 3D print is successfully completed, GCodePrintr will display the new "Print Completion Dialog" which shows the most important data points about the 3d print. The data can be shared with other Apps (Google+,Whatsapp,Twitter, Facebook,...) using Android sharing feature. 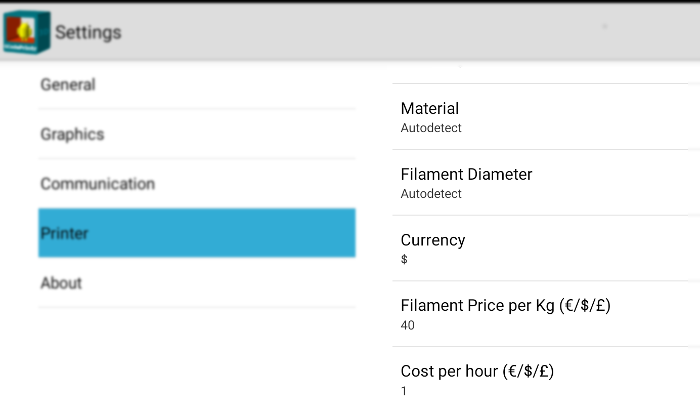 Configure filament price per kg, print operation cost per hour, currency and overwrite autodetection of filament material and diameter. 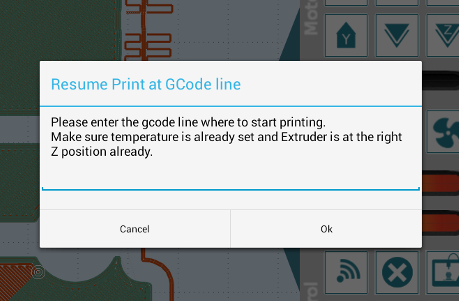 GcodePrintr comes with more predefined macros for manual bed leveling, toggle between two extruders, fix x/y displacement, .. 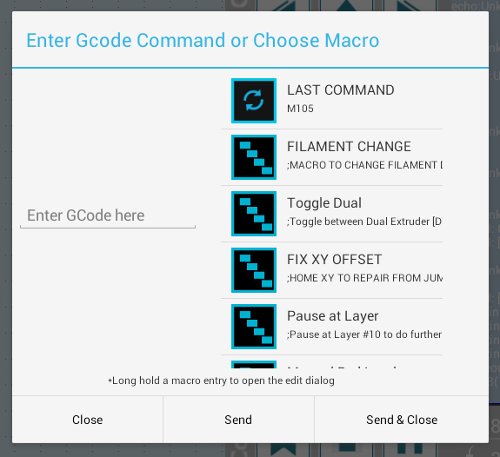 Previous versions of GCodePrintr allowed to define custom gcode macros to easily choose and execute a set of gcode commands. This version adds some sepcial keywords to write more powerfull macros, including showing dialogs for user interaction, playing sound, pause at a defined layer,..
A new GCocdePrintr option allows to send broadcast intents on certain events. These intents can be listened to by Android automation frameworks (e.g. Tasker) and used to trigger actions (like sending email notification. GCodePrintr uses the "Fast" Gcode Parser now by default. It improves the model load time significantly. In addition it requires less memory and therefore supports larger 3d models. 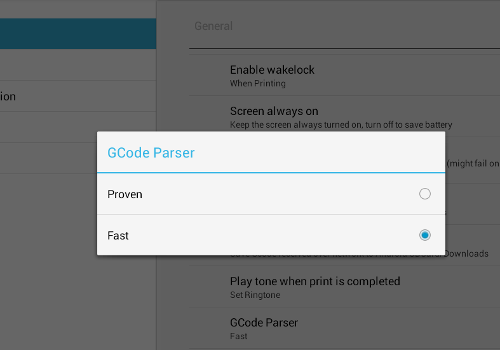 The old gcode parser ("Proven") is still available in the options. Printers with CH341/CH340 serial chips are now supported. GcodePrintr is now multi-language ready. In addition to English, it has been translated to German.